First free 12-piece beauty sample bag at Sephora 2019! Also, great limited edition beauty box: Lookfantastic x Erno Laszlo Beauty Box! Sephora and Sephora.ca (NEW) (NEW) Receive a January Skincare Sample Bag with any $35 purchase. Use code DREAMSKIN. See what’s in the bag here. (NEW) 2x points on skincare, ends 1/21. This post may contain affiliate links. Read the full disclosure. Marks & Spencer will offer their gorgeous M&S Summer Beauty Box which is worth over £135, for only £15 when they spend £40 or more on Clothing, Beauty or Home from the 31 May. 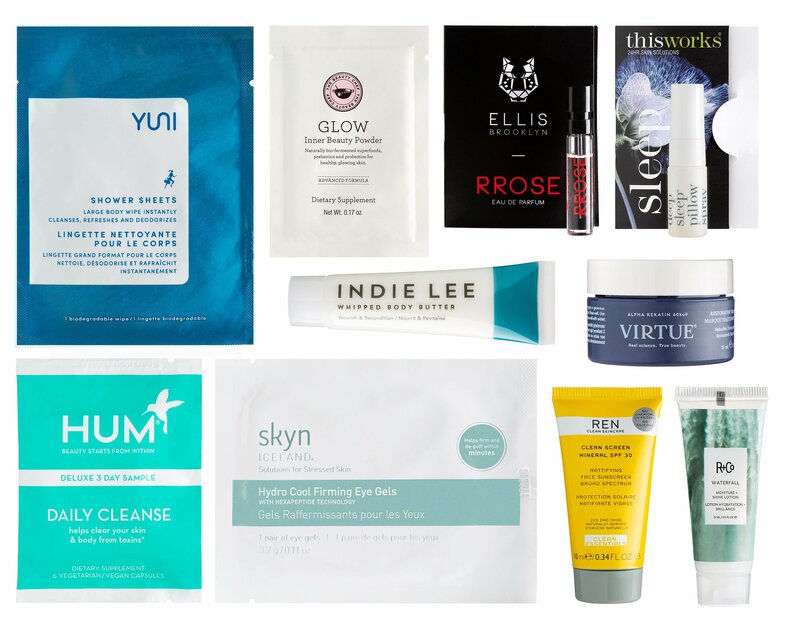 M&S Summer Beauty Box 2018 contains: This post may contain affiliate links. Read the full disclosure. Calling all Amazon Prime Members, there are three new Amazon Sample Boxes that you can get it for free after credit! Plus, an amazing and rare gift with purchase offer from Marc Jacobs Beauty! Marc Jacobs Beauty (NEW)(HOT) Receive the free samples in mini Blacquer Highliner, mini Enamored Hi-Shine Gloss Lip Lacquer in Sugar Sugar, mini Velvet Noir Major Volume Mascara, and the Blacquer pochette, with a $35 order, This post may contain affiliate links. Read the full disclosure. Hurry on over NORDSTROM beauty, where you can score six-piece deluxe size Shiseido gift with any two Shiseido purchase. In addition, there are awesome Target Beauty Boxes $7 (up to $31 value), Ulta 10pc haircare sample + free full size gift and Bon Ton 10% off all beauty + Lancome 6pc gift. NORDSTROM (NEW) Receive a cosmetics bag and deluxe samples of Perfect Cleansing Oil (1.3 oz. ), Ultimune Power Infusing Concentrate (0.33 oz. ), Bio-Performance LiftDynamic Serum (0.25 oz. ), Bio-Performance LiftDynamic Cream (0.35 oz.) and Urban Environment UV Protection Cream SPF 40 (0.57 oz.) with your purchase of two Shiseido items. An $84 value. This gift will sell out quickly! This post may contain affiliate links. Read the full disclosure. Unboxing: Bluemercury FREE Guerlain Lipsticks at checkout and 3 Free Samples Today! I just wanted to let you guys know that there’s a great ‘pick 3 free samples’ at checkout at Bluemercury. I’d like to share my joy – unboxed Bluemercry x Guerlain free gift with purchase! Plus, what’s available today and my recommendation! Bluemercury (NEW) Choose 3 free samples at checkout (really good choice) – thanks our lovely reader 007 for the tip! Free 2-day shipping all order no minimum! UPDATE: See below for the Bliss update! This post may contain affiliate links. Read the full disclosure. Memorial Day 2017 – Beauty Deals and Gift with Purchase You Can’t Afford To Miss! This is a roundup of the best beauty deals this Memorial Day weekend. While the holiday is a time to honor and remember those who died in service, the deepest discount, the greatest freebies and rare beauty deals are everywhere. Below, where to shop for Memorial Day deals – A to Z guide!! b-glowing (NEW)(HOT) Use Promo Code: BGSAVE to get 20% off all items $50+ through 5:45pm Central Time on 5/30/17. (NEW) Get 20% off Skincare orders $60 or more with code SKINCARE20! Valid 5/25-5/31. This post may contain affiliate links. Read the full disclosure. Nordstrom let you shop your beauty essential 10% off and tech gifts at up to 40% off. Plus, one day only BOGO free + more treats at Philosophy, HELLO KITTY Peter Thomas Roth collection, HUDA 3D Palettes (will sell out) and new Canadian Lancome purchase with purchase 2017. HOT DEAL 1 NORDSTROM (NEW)(HOT) Save up to 40% off fitbit and tech gift for mom (limited quantity). This post may contain affiliate links. Read the full disclosure. I like the free beauty samples at Bluemercury since Macy’s bought Bluemercury in 2016 – including today’s sample bag! Amazon is offering up a new Dollar Shave Club sampler box for $1! See new and hot beauty offers from your favorite department stores and online retailer below! Bluemercury (NEW) Use code PERFECTION to receive your 7pc deluxe samples with any $75 sitewide purchase. (1d) Free 2-day shipping all order no minimum and free returns! This post may contain affiliate links. Read the full disclosure.